Gust Gab Reviews & Give Aways: Back it Up! Carbonite...A Give Away! Back it Up! Carbonite...A Give Away! 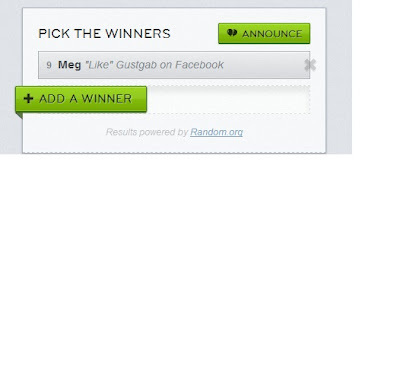 CONGRATS Meg! 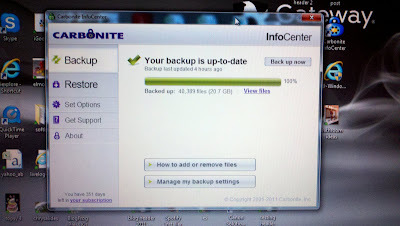 I will email you the details of your free year of Carbonite Online Back Up! I really liked it...and will use it as often as I can with my give aways going forward...don't forget to click on the 'I did this' box next to the entries!! Come back again soon and see what other give aways I have coming down the pipeline! My main reason for blogging is so that I have a place to collect the literally hundred of pictures that I take each and every month - and make some rhyme and reason out of them. At the end of each year, I take my blog and turn it into a hard cover book...one day, I will gift these books to our kids who will have beautifully bound books of our adventures, complete with narrative. I hope they will enjoy them & share them with generations to come. I love love love looking at old photos of my family. there are most likely another dozen or so at home. I am sort of a nut about pictures...I just love them. I have them on memory cards, the computer, (some) backed up to online sharing sites, and the blog. Every once in awhile - I spend a good chunk of time and I back them up to an External Hard Drive as well. All of this is well and good - as long as nothing ever happens to said devices. Water damage, fire damage, kid damage? I have huge volumes of pictures I'd be devastated if I lost. Life had been hectic and my pictures were NOT backed up. Not a one from the summer. Enter Carbonite Online Back Up. I'd heard commercials for Carbonite and thought - oh, I wish I could afford something like that. But really, how can you NOT afford it. How would YOU feel if your computer crashed & you lost everything? I couldn't wait to back up my files! Carbonite has a very user friendly, easy to read, easy to follow website. It took my computer 14 days to back up! It was hard to keep the computer on, and in non-sleep mode while it needed to do it's initial thing. Go ahead - see for yourself. Hello? Want to show Grandma a few pictures that didn't make the blog? Now I can! Log in to Grandma's computer with your Carbonite information and viola! Access to all of your pictures! No limit to how much you can back up!! I stopped 'backing up' all of my pictures when an online photo sharing site began limiting how much you could store in each album...and now...everything is backed up, automatically. Even the goofy random outtakes I can't possibly delete! 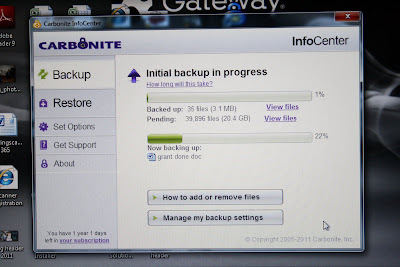 Carbonite back up is available for just $59.00 a year! Less than $5.00 a month you guys! Do you use an online back up system? Have you heard of or tried Carbonite? OR...you can leave a comment here and be entered to win your very own, one year subscription of Carbonite! I'm trying out this fancy new way of hosting the give away - I've absolutely loved it on other blogs, so I hope it's as easy and fun as it appears to be! The winner of a one year FREE subscription to Carbonite Online Back Up will be chosen on Monday, November 28th, 2011.Good Luck! This would be great for the gagillion pictures I've taken of Samantha so far. Not to mention the thousands of other photos I have. We have a different online backup system, but this one seems MUCH more user friendly! I sometimes get around to uploading pics from the cameras & phones, occasionally back up those pics to our external drive & also burn them to a disc, and even less often I upload them to Flickr. It's a time consuming mess, so I don't do it often. If I didn't have to go through all the extra steps & it just backed up on its own, I'd probably be more likely to get the photos off the memory card & onto the computer! Yes, Carbonite can be a bit of an undesirable spot for my hero Hans Solo, but for us mere mortals, it's worth every cent. So far I've gladly given 4 years to the big purple padlock, and while I'm still waiting for my fence to be fried, when it does, I'll be sitting in my swivel chair .... well, sort of contently swivelling ....and reminding myself of Hans and his immortal quote from ESB “Laugh it up, fuzzball!”. Long Live the Purple Padlock! I actually back up our computer that doesn't have our photos on it because I use it for work. And actually I think I would be more ok with losing my work data than a single picture. Oh my carbonite, how wonderful to recite. No need for fright, so outasight. My car, my bone (dearest Jack Russell, that is), my life’s del-ite. Any hey, if you wanna use this – I got copyright! Boo-hoo! My 2 comments aren't mentioned in the Rafflecopter summary. What's up, darcie? @darcie - Hum ..... I never got a 'I did this' thingy. I just got inspired write, posted comment (little prayer included), and I took it as a done thing since the comment was there along with everyone's. I didn't get anything else. Ho-hum. Cub Foods - Nutritional Q&A & Give Away! CHEERios - A Give Away! BK Crown Program - $25 Gift Card Give Away! Big G Cereal Heros - A Give Away!